Globes were traditionally made using gores – 12 or 16 shaped paper or vellum strips pasted to a sphere with ‘calottes’ or caps to cover the inevitable untidiness at the joins at the north and south pole and subsequently mounted at 23½° off the vertical to replicate earth’s tilt in space. To maintain this angle lead shot was used to balance. Some globes were manufactured to be portable whereby they can be disassembled in 48 pieces. 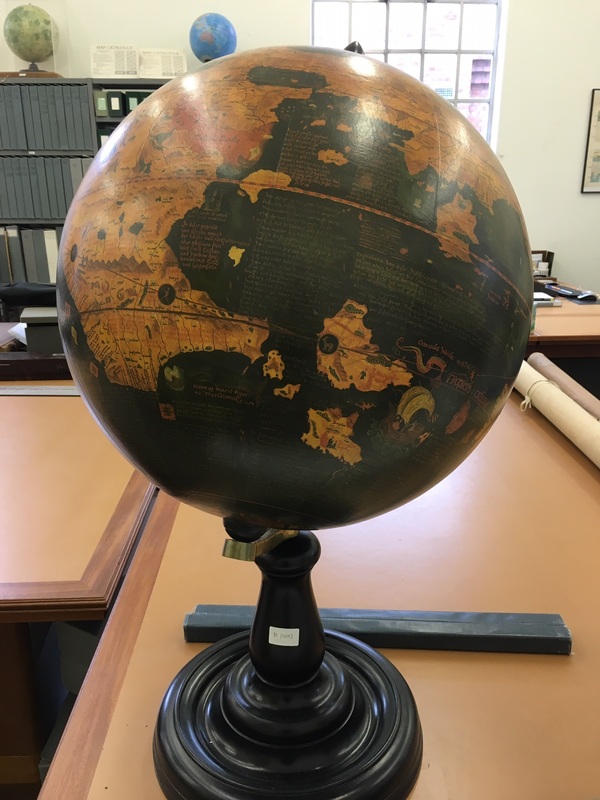 Modern self-supporting globes use sections that bear very little resemblance to the elegant gore. 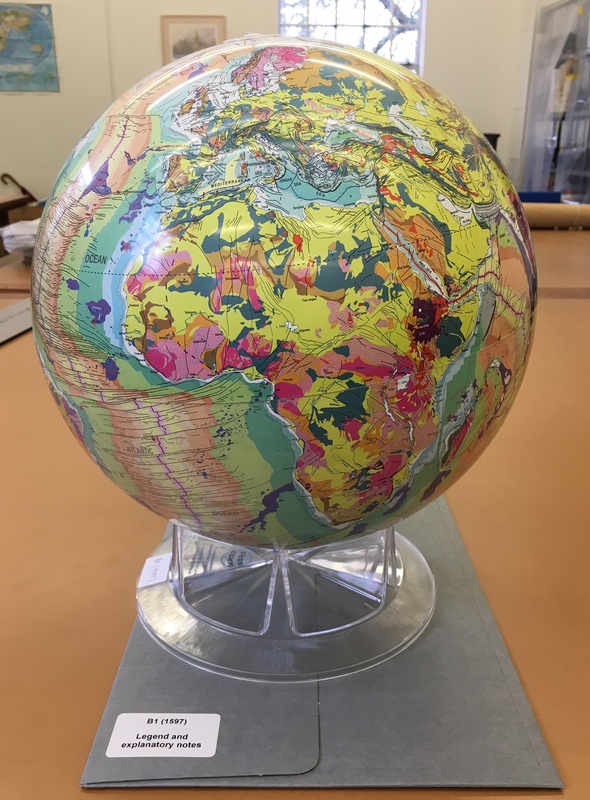 The traditional skill of globe making has been revived recently by Greaves & Thomas a small company specialising in the production of all manner of globes “spanning cartographic history from 1492 to the present day”. The Bodleian has never restricted itself to collecting justbooks and manuscripts. 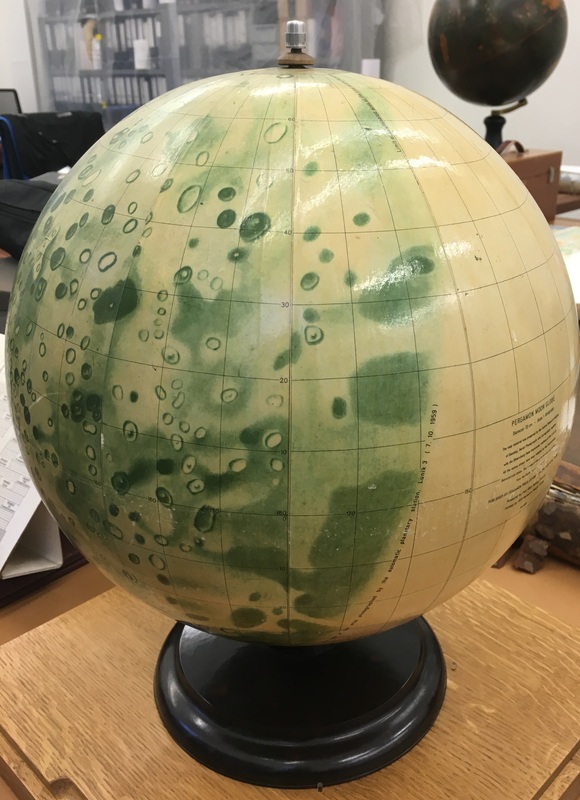 Indeed it was Sir Thomas Bodley who purchased a pair of extravagantly expensive terrestrial and celestial Molyneux globes (1592) and subsequently bemoaned the fact they were getting ‘slurred’ (smudged) and so their upkeep would become a continuous charge. This proved to be the case as the Bodleian accounts show payments made to the joiner in 1629, 1636 and in 1644 for mending one or other of the globes. This pair was discarded in favour of a pair of Blaeu globes which can be seen on a contemporary print by David Loggan of Duke Humfrey’s Library in 1675. It appears these were also rejected in favour of a more modern (and smaller) pair of John Senex globes dating from 1728. 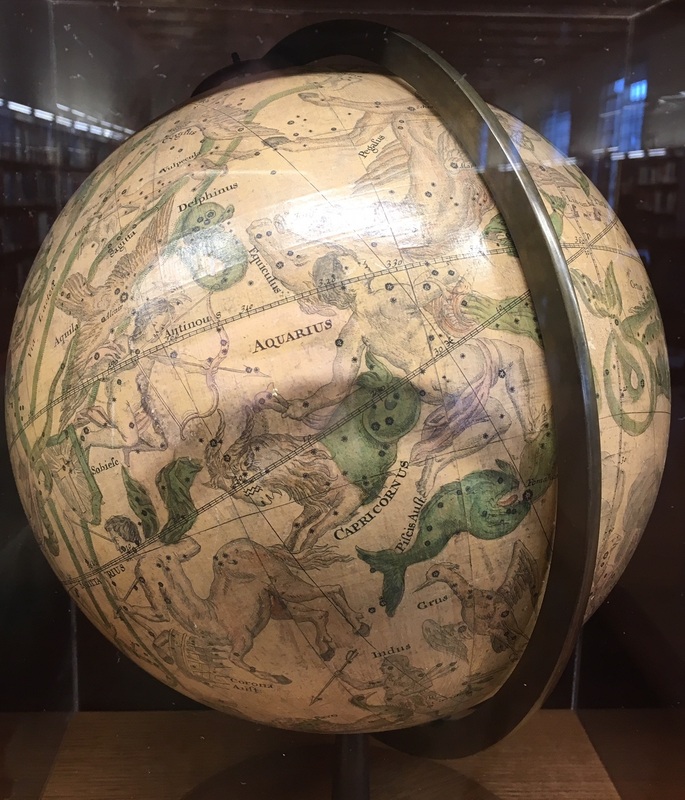 It is this pair which reside in the Rare Books and Manuscript Reading Room of the Weston Library. .
Today globes are more likely to be found as blow ups, pop ups or large installations. 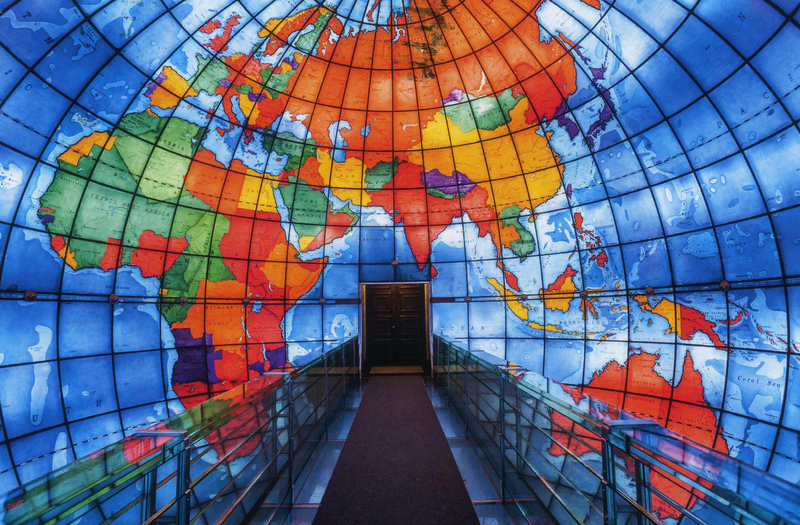 Examples of this more public structure can be found in Boston, Massachusetts as the Mapparium in the Mary Baker Eddy Library and De Lorme’s Eartha globe in Yarmouth, Maine but equally the inflatable globe functions well as a ball on a beach. ‘Three dimensional atlases’ are now being published as pop ups of hemispheres, illustrating text wonderfully for younger readers. Miniature globes were regarded as children’s toys with some educational value but the most peculiar is the ostrich egg. Sadly the Bodleian does not possess one of these wonderful objects but given its delicate structure it is only a decorative piece. This entry was posted in Cartography, Exploration, Geography, History, Travel, Uncategorized on 28 January 2019 by tessa. On days like this it is a real privilege to do my job. 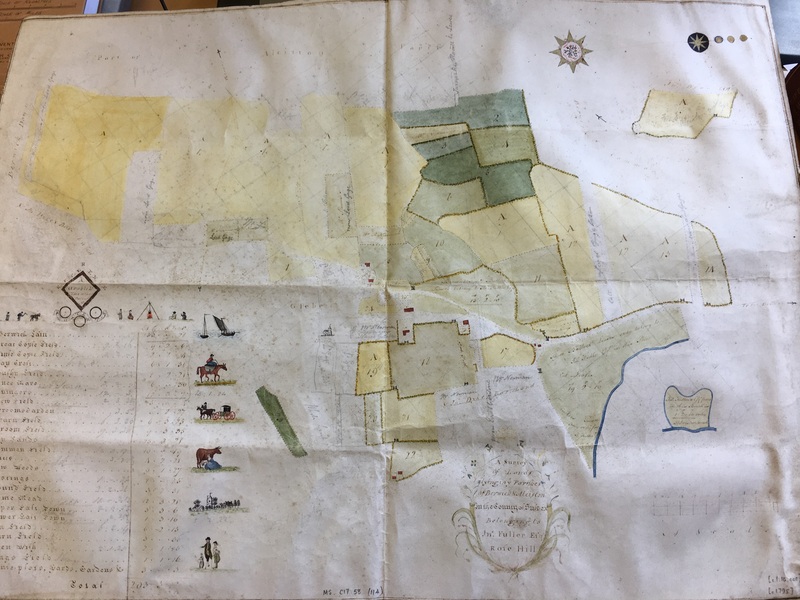 This rather lovely manuscript map from around 1795 has been recently purchased to enrich our holdings of large scale parish maps and estate plans but a happy time was spent cataloguing it. 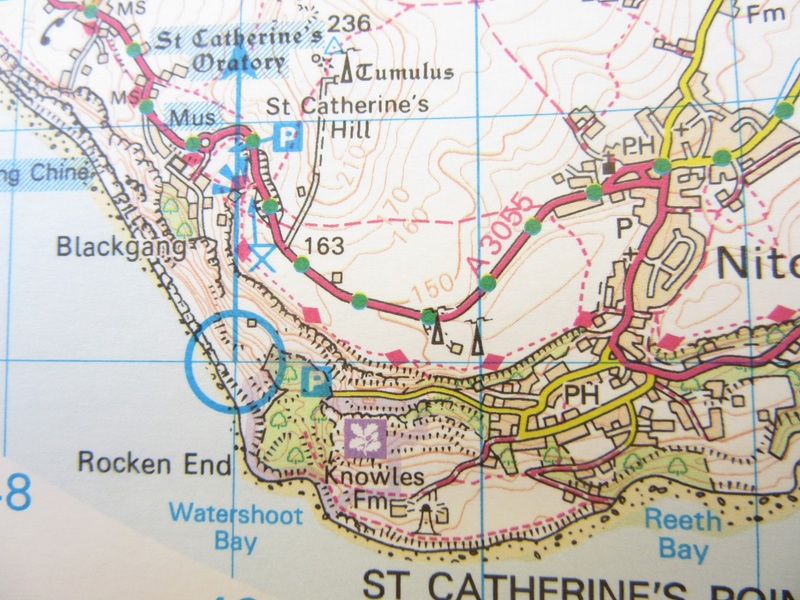 The map is of part of the parishes of Berwick and Alciston north west of Eastbourne in East Sussex showing the lands belonging to “Jn. Fuller Esq.” This gentleman known at the time as “Mad Jack” Fuller (although he preferred “Honest John” Fuller) inherited his estate, Rose Hill, from his uncle in 1777. It is lands attached to this estate, which is now Brightling Park, which feature on the map. 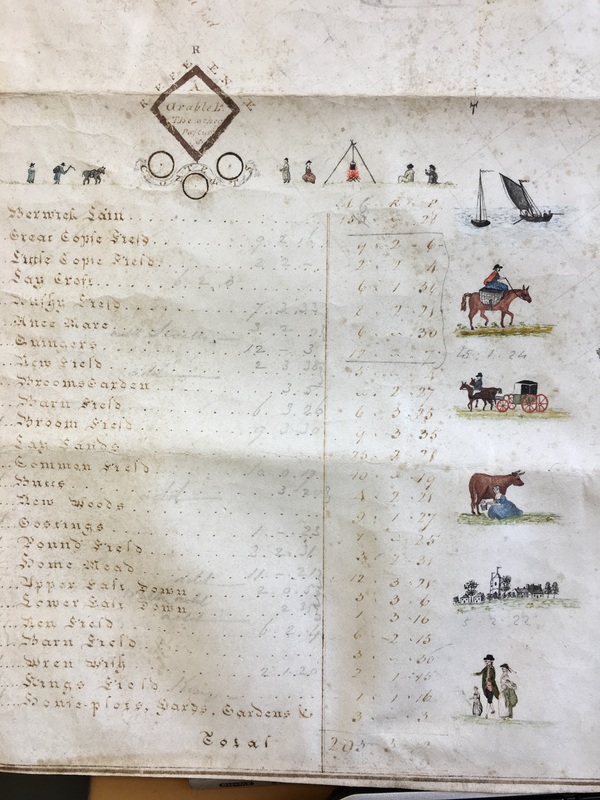 Unfortunately the surveyor is not known nonetheless it is a pretty thing with beautiful penmanship and little vignettes of people and items likely to be found on the land. The little details are charming: the field gates are drawn in as is a view of the church and the compass rose is embellished with gilt. The lands belonging to “Mad Jack” are numbered to a key giving field names and acreages with the remaining parcels of land having their owners names and areas scribed on them. The scale of approximately 1:10,000 (6” to 1 mile) is large enough to show the area in reasonable detail. It was obviously a working document as you can see many later corrections and additions in pencil, as well as the surveyor’s grid. The fact that it has been produced on parchment also point to the fact it was heavily used, as paper wouldn’t be up to the task. 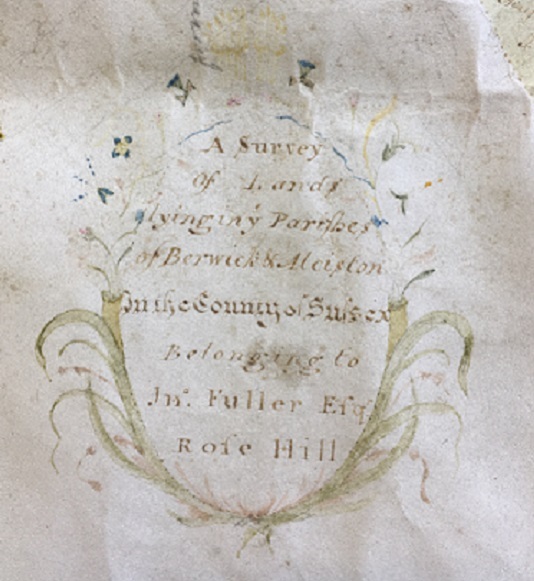 John Fuller was born into a wealthy family of iron makers and politicians in Hampshire in 1757 and initially forged a career in a light infantry company in the Sussex Militia. He subsequently spent two spells in parliament as an MP, the first representing Southampton from 1780 to 1784 and then as member for Sussex from 1801 to 1812. A noted drunk, he was famous for his eccentricities and follies and even received permission to build a 20ft high pyramid as a tomb in the churchyard of St Thomas à Becket in Brightling. In later life he turned to philanthropy, supporting among others the young Michael Faraday and the Royal Institution. He died in April 1834 and was buried beneath his pyramid folly. 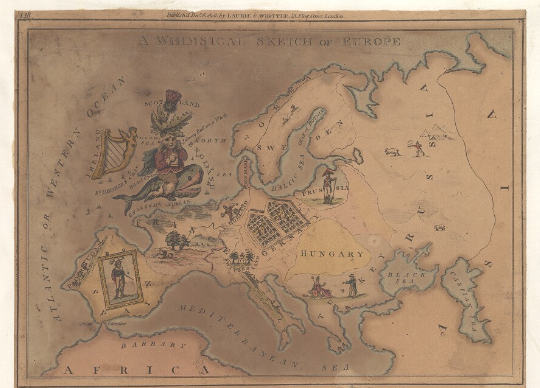 This entry was posted in Britain, Cartography, History, Uncategorized on 14 January 2019 by tessa. 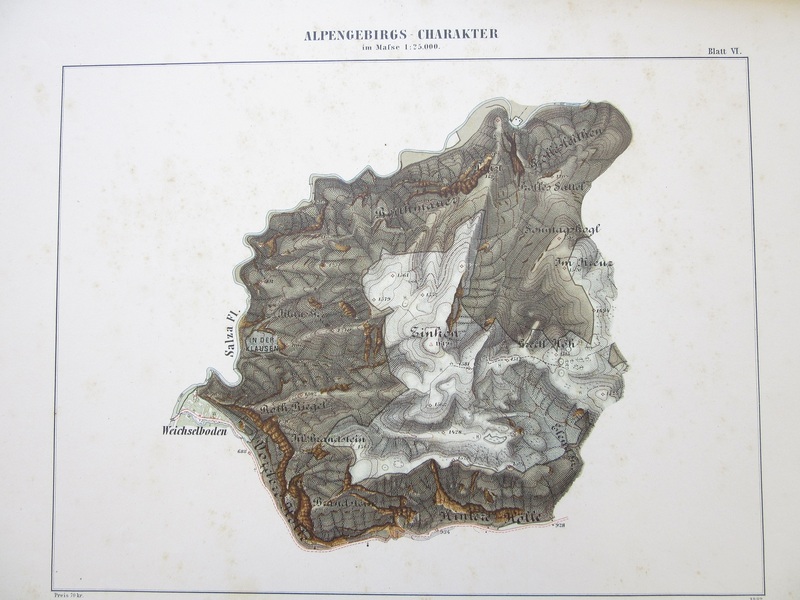 Maps come in all sorts of shapes and sizes and one recent purchase by the Rare Books Section was not one I’d seen before. 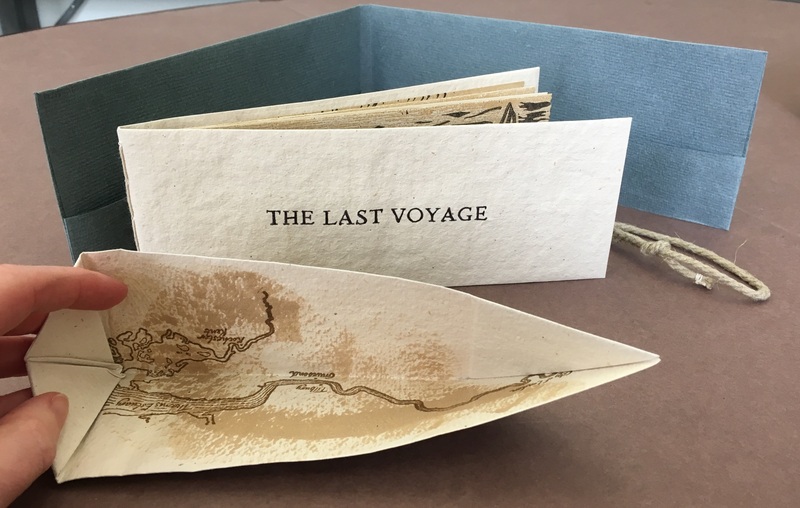 The artist’s book The last voyage by Tracey Bush is based on a poem by a seventeenth century wit John Taylor who undertook a journey in a paper boat with two stockfish tied to canes for oars from London to Queenborough on the Isle of Sheppey in Kent. The map is fashioned into a hand folded paper model of a boat which is accompanied by a booklet with extracts of the poem In praise of the hemp-seed written by Taylor to describe his journey. The booklet and boat are made entirely by hemp paper and are contained in a folder secured by a small piece of hemp rope. This artistic use of maps is increasing with the popularity of maps as visual objects and you can see them everywhere – mugs, mouse mats and even the former First Lady’s dress. What is it about maps that is so appealing? Is it the potential for a journey? The depiction of something (generally) real? Or do they just make pretty things to look at? Whatever the draw it has been going on for centuries as can be seen by Leo Belgicus which was first drawn in 1583 by Michaël Eytzinger, an Austrian cartographer. 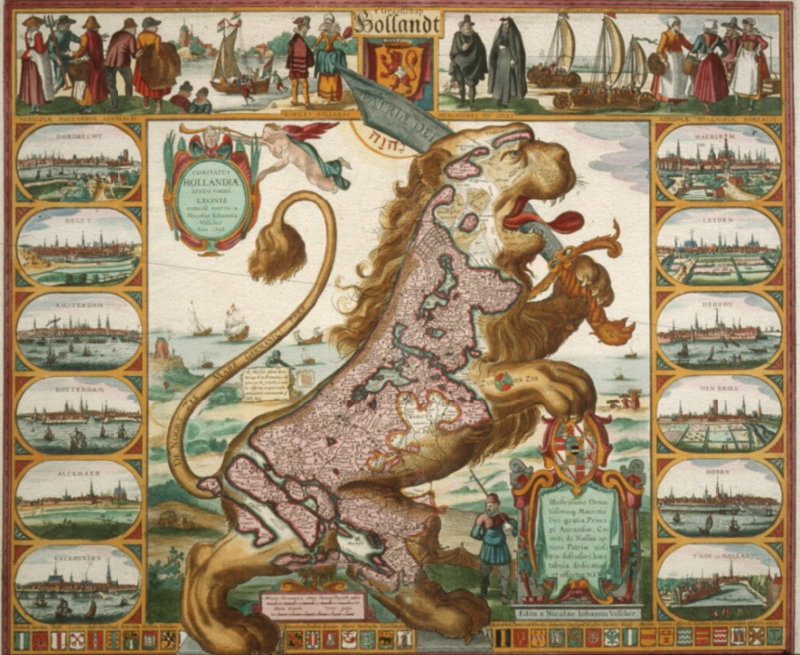 He depicted the Low Countries as a lion rampant facing east, an image which was popular in various forms for many years. As was closer to home James Gillray’s caricature of England as an old woman seated on a sea creature. Otherwise it is the content, rather than the appearance of the map which is more important – who hasn’t seen advertisements for items personalised with a map of a significant location in cufflinks, necklaces and puzzles. 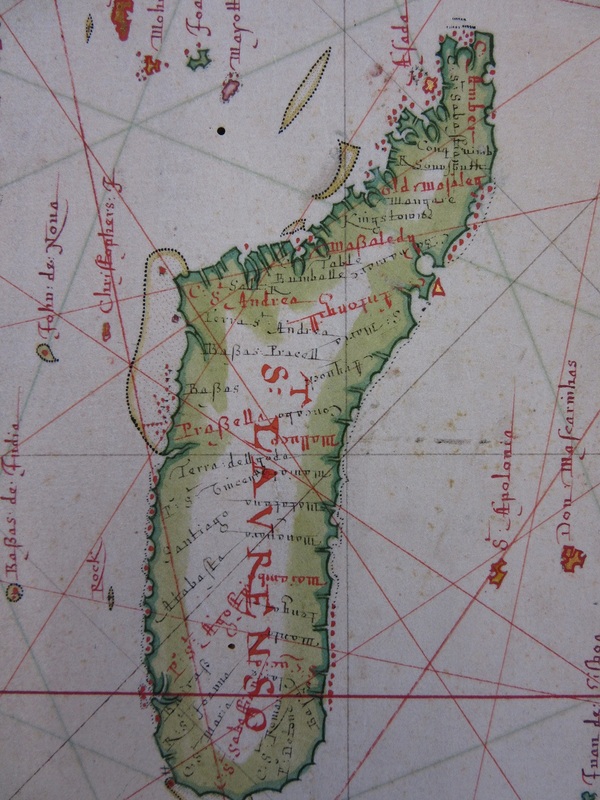 This entry was posted in Cartography, Exploration, History, Travel on 21 May 2018 by tessa. 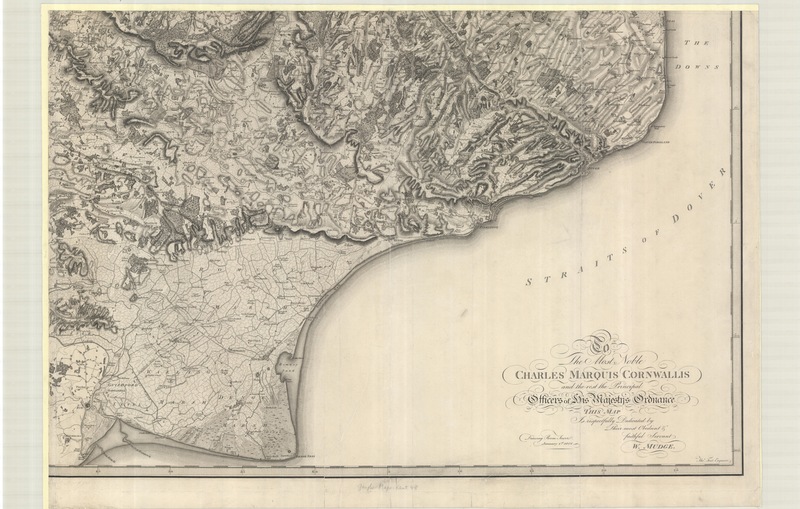 We came across this map, on a very unusual projection, while processing a previously uncatalogued set of nineteenth century French sea charts produced by the Dépôt des cartes et plans de la marine. 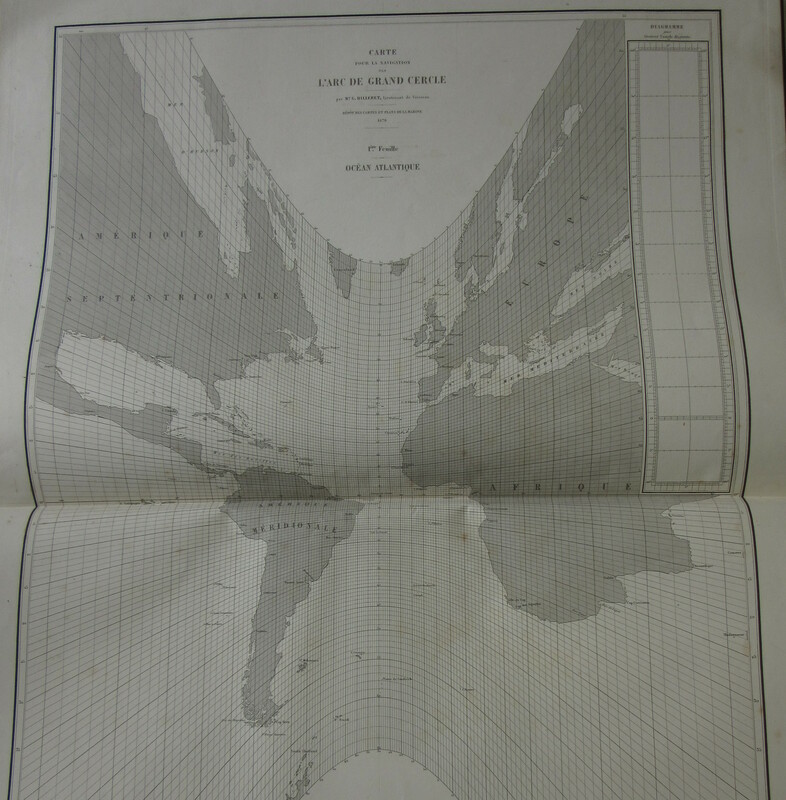 Most are standard nautical charts, but this one – part of a set of three – is extraordinary. The world appears to have been turned inside out; the chart is centred on the central Atlantic, and the land masses are progressively larger and more distorted the further they are from this point. The other two charts represent the Pacific and Indian Oceans in the same way. 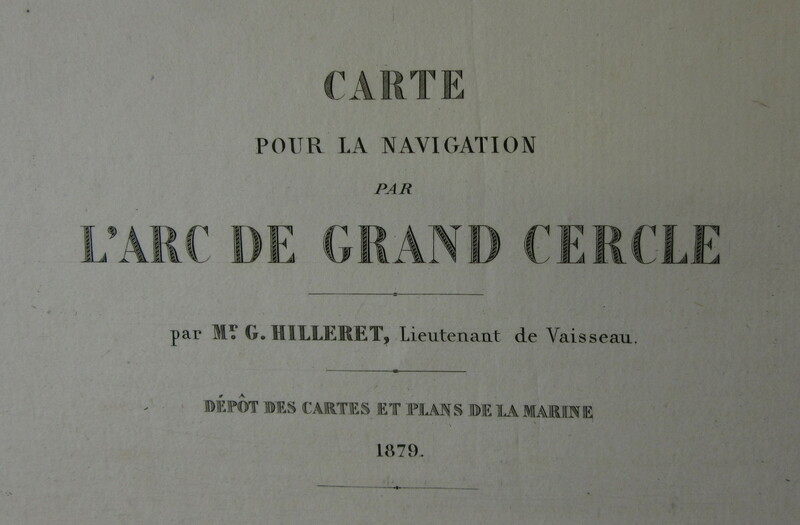 The title makes the chart’s purpose clear: ‘Carte pour la navigation par l’arc de grand circle’. A great circle is, technically, the point at which the surface of a sphere intersects with a plane passing through its centre. In practical terms, a great circle drawn on the surface of the Earth between 2 points will be the shortest distance between those points (the Earth is not, of course, a perfect sphere, but it is close enough for this to be of use). Navigational charts are traditionally drawn on the Mercator projection. This has the great advantage of showing a line of constant bearing (rhumb line) on the Earth’s surface as a straight line on the map. This is the simplest course to navigate, as mariners have known for many hundreds of years, but it is not the shortest. The shortest route is a great circle, and this requires constant adjustment of direction to stay on course. Sailing ships were limited by the challenges of winds and currents, and early steam ships by the need to refuel, but from the 1870s this principle began to have more practical applications. A straight line drawn on this orthodromic chart is a great circle course between the two points it connects, enabling navigators to plan their great circle journeys relatively easily. These charts were published in 1879. 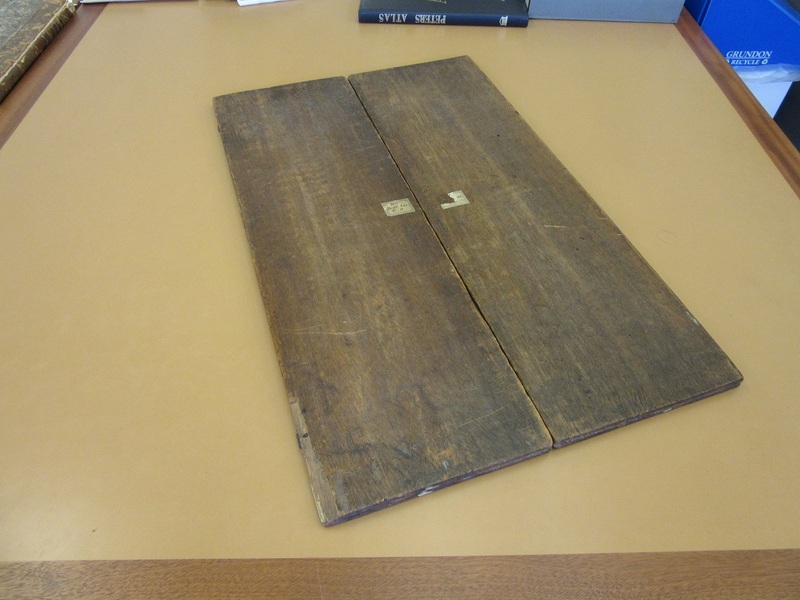 Charts of this sort do not appear to have passed into common use, and there could be several reasons for this. For one thing, the difficulties of plotting a great circle course are sufficient to outweigh the advantages for all but the longest ocean crossing journeys. Mariners continued to use rhumb line navigation well into the late twentieth century, by which time GPS systems had come into use. When a great circle course was followed, for sea or air travel, it was calculated in advance, sometimes using a chart of this sort. The course would then be plotted onto a Mercator projection chart where it was easier to follow. The usefulness of great circles can be seen most clearly on a modern map of long distance air travel. This is why aeroplane routes from, say, London to San Francisco always appear oddly curved when viewed on a map, with the route going much much north than you would expect. This is a great circle course, and the shortest way to connect two distant cities. A demonstration can be seen on this useful site http://demonstrations.wolfram.com/GreatCirclesOnMercatorsChart/. The charts were created by Gustave Hilleret, a naval lieutenant and teacher at the École supérieure de guerre navale, who also published books on navigation. The projection is the Gnomonic projection with Equatorial aspect; the charts’ Bodleian shelfmark is B1 a.61/1 [39-41]. This entry was posted in Cartography, Technology, Travel on 16 May 2018 by debbie. 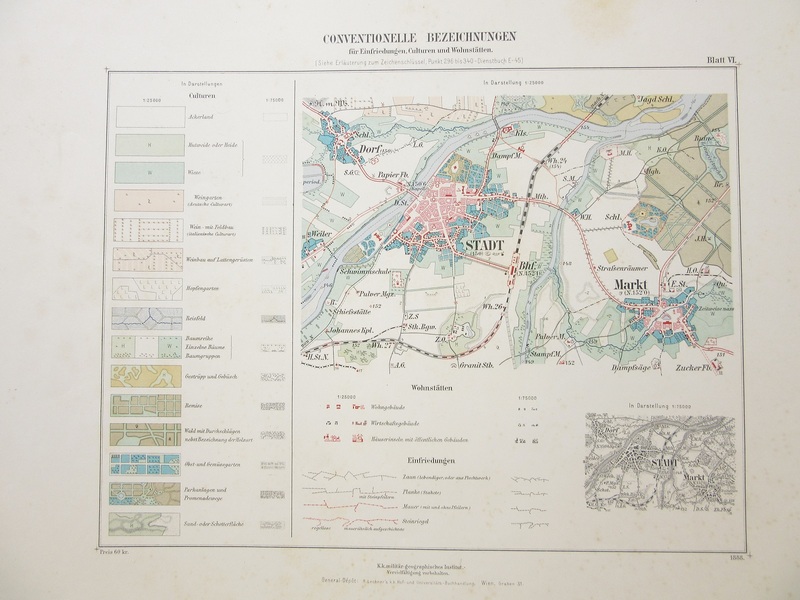 The Ordnance Survey have been producing maps since the early 1800s when the first in a long sequence at 1″ to a mile was produced in preparation for a possible invasion by the French Revolutionary armies. Four sheets were published covering South East England. Over years these maps, through changes in production, design and conversion from imperial to metric have morphed into the 1:50,000 Landranger maps we buy now. 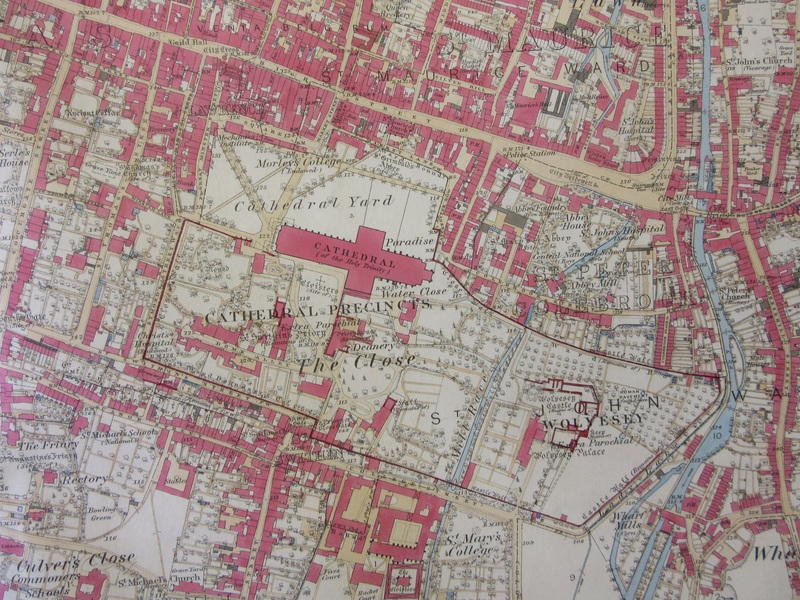 Lesser known than the maps we buy in shops are the detailed large scale mapping that have been produced since the middle of the Nineteenth Century and are now available digitally within the library (contact maps@bodleian.ox.ac.uk for more information). Maps at 1:2,500 scale (25″ to a mile) cover almost all the country (moorland with no habitation wasn’t covered) at such detail that individual buildings and many trees can be shown and the amount of social as well as topographic information is comprehensive. Thousands of sheets were published, and there were in most cases at least 3 editions leading up to the end of the Second World War. 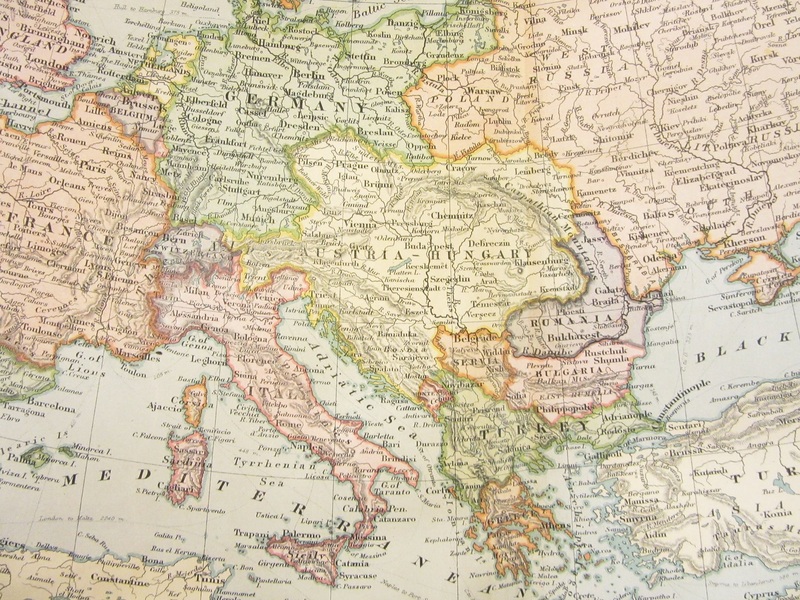 This series of mapping included Wales, Scotland and Ireland as well as England. The first edition was available both coloured and un-coloured. As well as a marvellous resource for study the coloured sheets are also beautiful, as this extract of Winchester cathedral shows. Most of the town plans in the Bodleian, including Oxford, are in black and white. A few, such as Winchester here, were hand coloured. 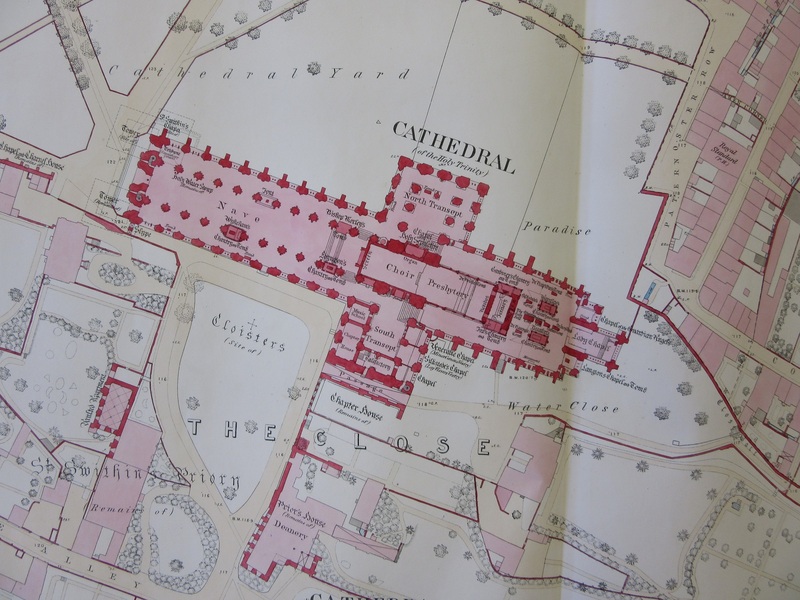 There are 27 sheets covering Winchester at this scale, and the amount of infrastructure, and hence the amount of hand-colouring on each, determines the cost. The cheapest were sold for 2 shillings a sheet while the most expensive went for 8 shillings. The Cathedral sheet sold for 7 shillings. 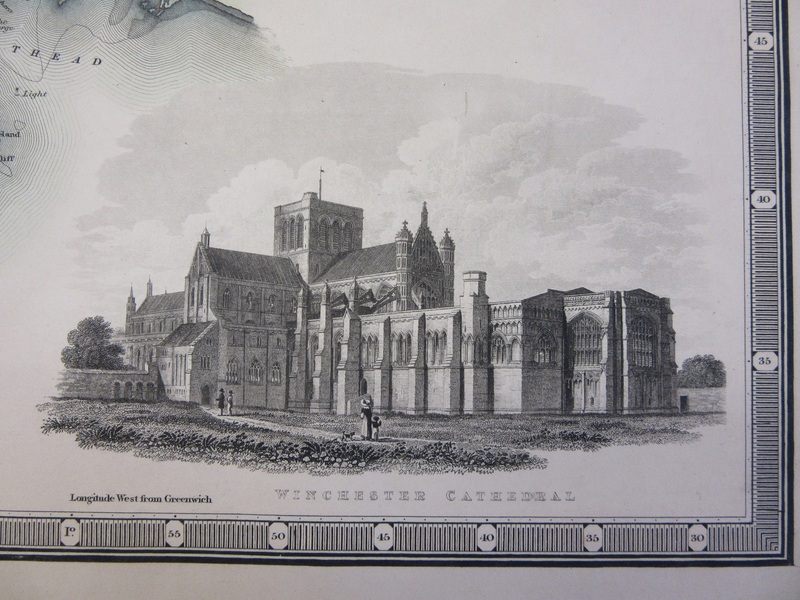 This image of Winchester Cathedral comes from the unusually titled ‘Map of the County of Southampton from and actual survey made in the years 1825 & 1826 by C & I. Greenwood’. This entry was posted in Cartography on 1 March 2018 by stuart. 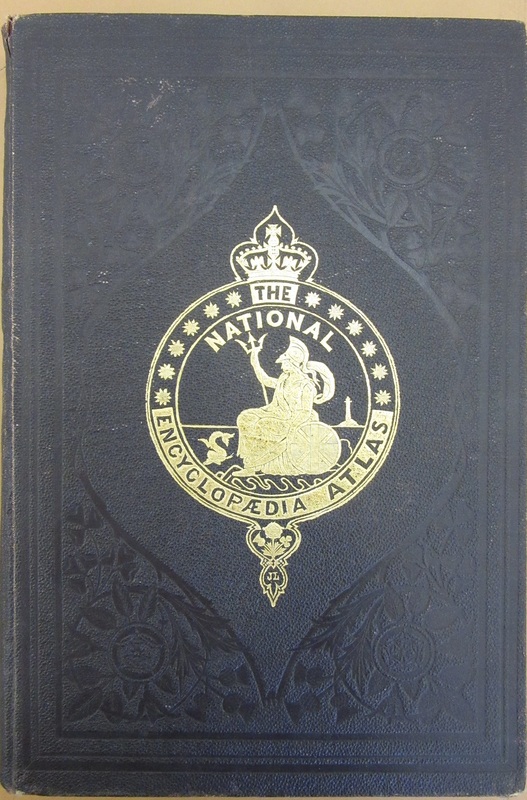 The National Encyclopædia Atlas is a beautiful example of a mid-Victorian atlas. 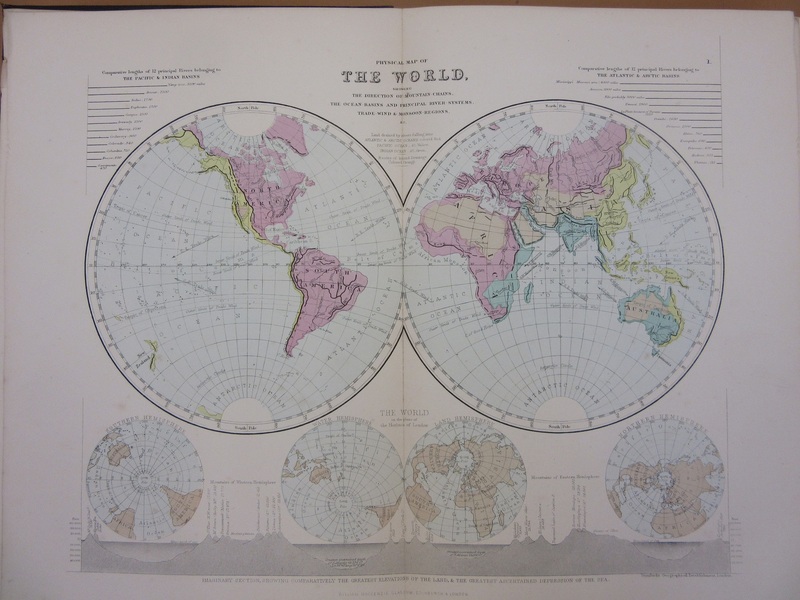 Published in 1868 and intended for both home and school the book features maps of the major countries of the World as well as a short introduction with a number of World maps. 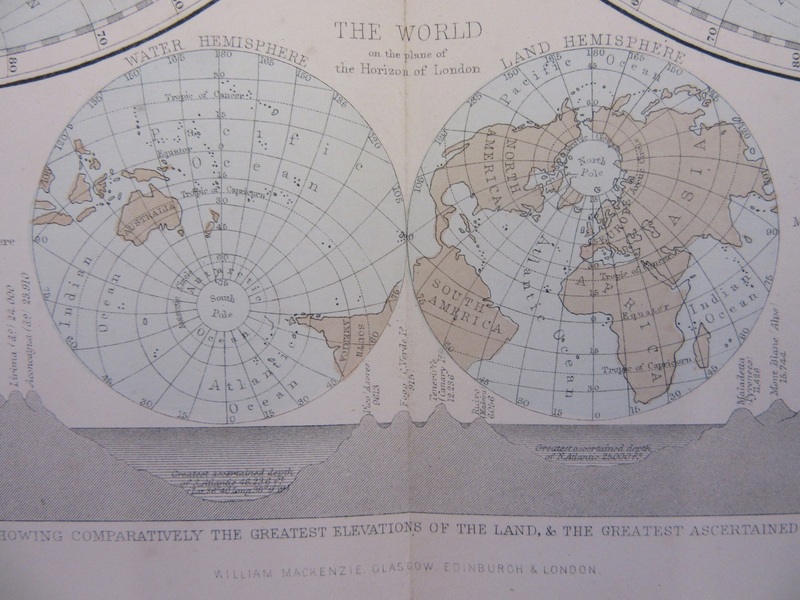 Using the double hemisphere method the atlas has two different World views, both thematic. 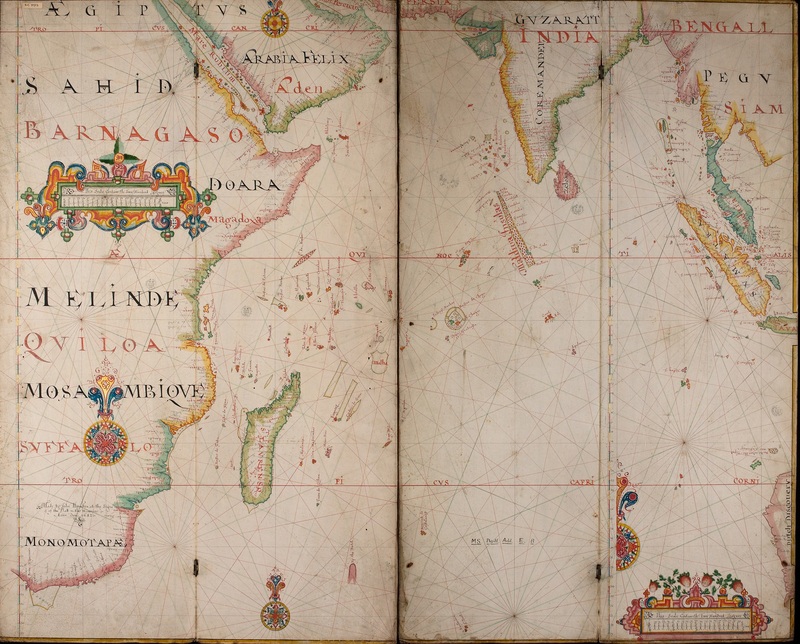 The first has a physical map showing mountain chains, river systems, trade winds and ocean basins, with views of the Northern and Southern Hemispheres and Land and Water Hemispheres. 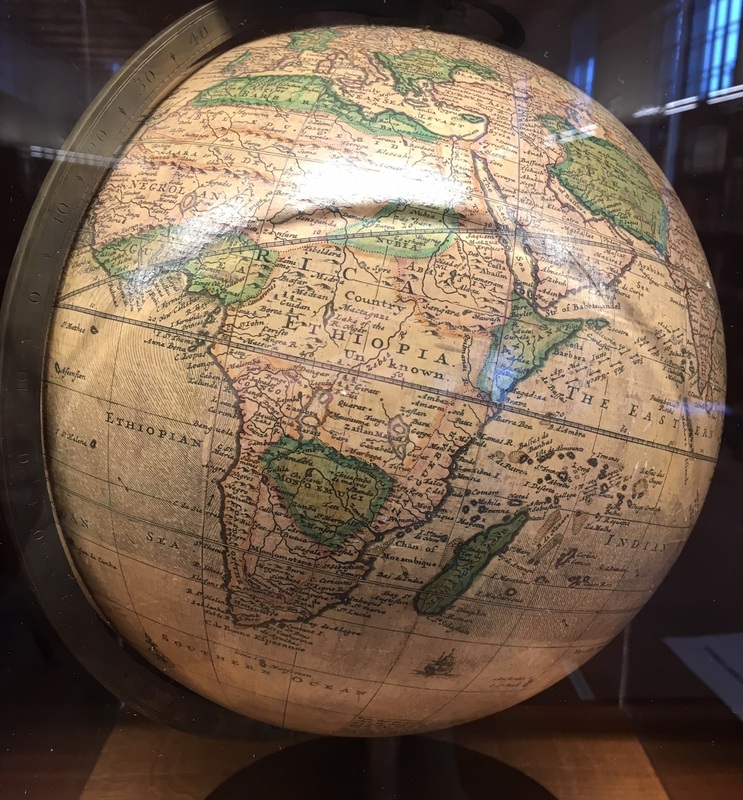 Double Hemisphere representation is a long-established way of portraying World maps, though the changing of the positioning of the poles to highlight a side of the Earth more land or water based is an unusual feature. Directly underneath the two hemispheres is a strip showing mountain profiles, describing itself as a ‘Imaginary section showing comparatively the greatest elevations of the land & the greatest ascertained depression of the sea’. 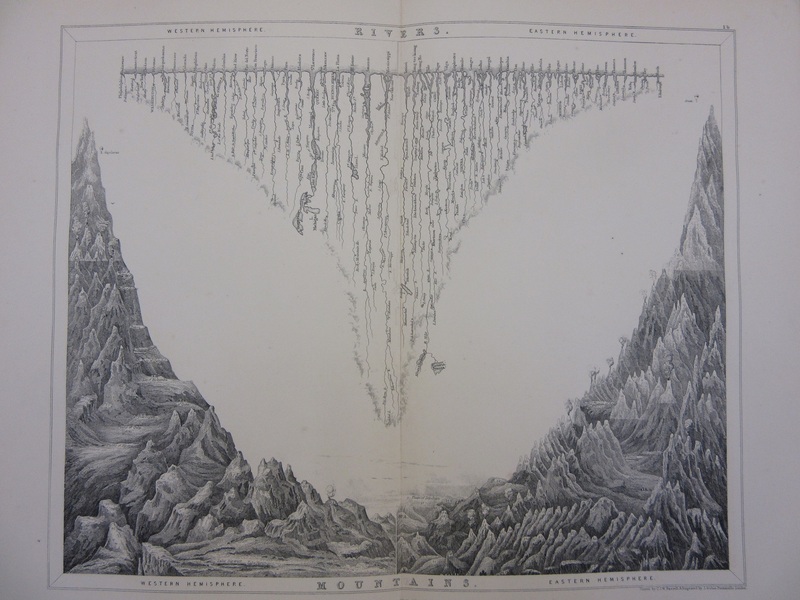 Mountains feature on the next page, with the highest in the Western and Eastern Hemispheres at left and right and river systems going from top to bottom. The highest mountain in the Eastern Hemisphere, on the right, is of course Mount Everest, which at the time of the atlas was measured at 29,002 feet (it is now measured at 29,029). Just above is a balloon labelled Green. Charles Green was a celebrated balloonist who in 1838 rose to 27,146 feet in an ascent which saw temperatures drop to as low as -27°. 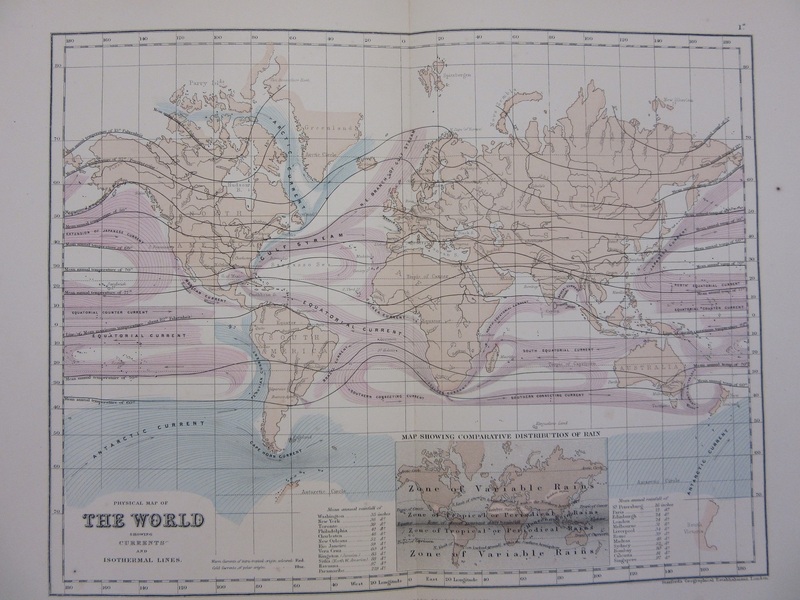 The second World Hemisphere map in the atlas shows ocean currents and isothermal lines (now called isotherms), as well as a small inset showing the comparative distribution of rain. Isothermals are lines showing areas where the temperature of air or sea are the same and is a term first used by the naturalist Alexander von Humboldt during his study of plant distribution throughout the World. Ocean currents are beautifully depicted in graceful pink curves and the map graphically shows the Gulf Stream and the Arctic Currents which have such an effect on the weather patterns and temperatures of Great Britain and the East Coast of the United States. This entry was posted in Cartography on 11 January 2018 by stuart. 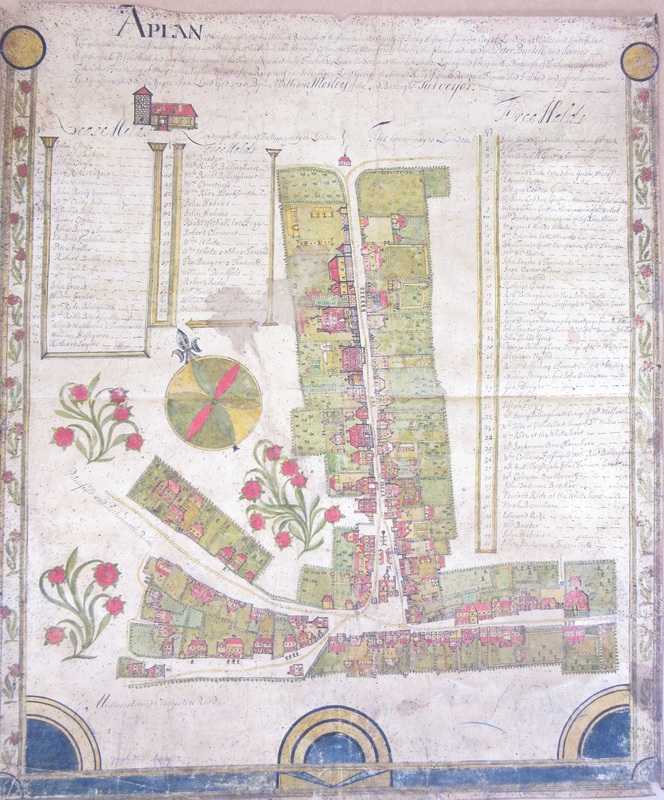 This beautiful map, ‘A plan of the situation of the ancient borough of Haslemere in the county of Surrey…’ is a colourful and detailed example of a cadastral plan, a map designed to show individual buildings and ownership. The map shows what is now the High Street in the town. Listed either side of the plan are the lease and free holds with the houses numbered and occupants listed. The biggest house, nu 2, belonged to John Tanner, Gentleman. John Tanner’s house, number 2. Staining and black dots evident in this close-up. 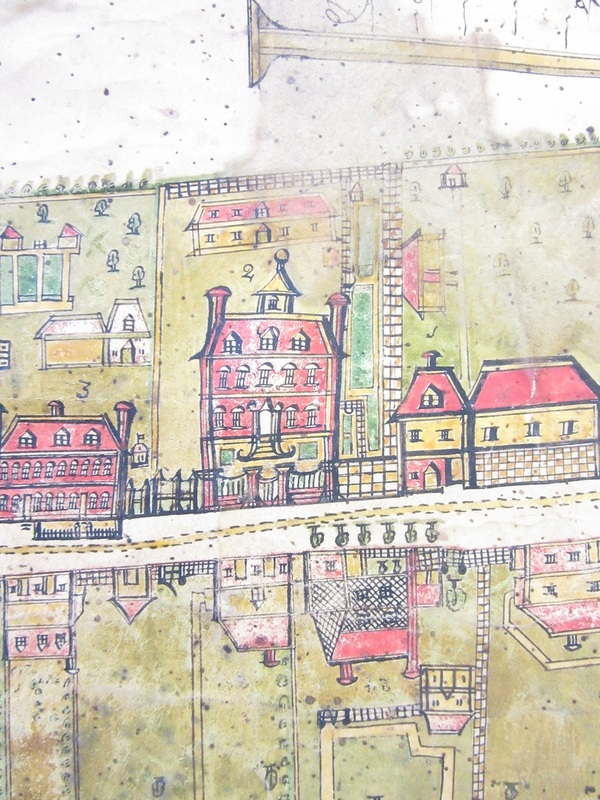 Drawn onto vellum in 1735 the map is showing signs of damage. 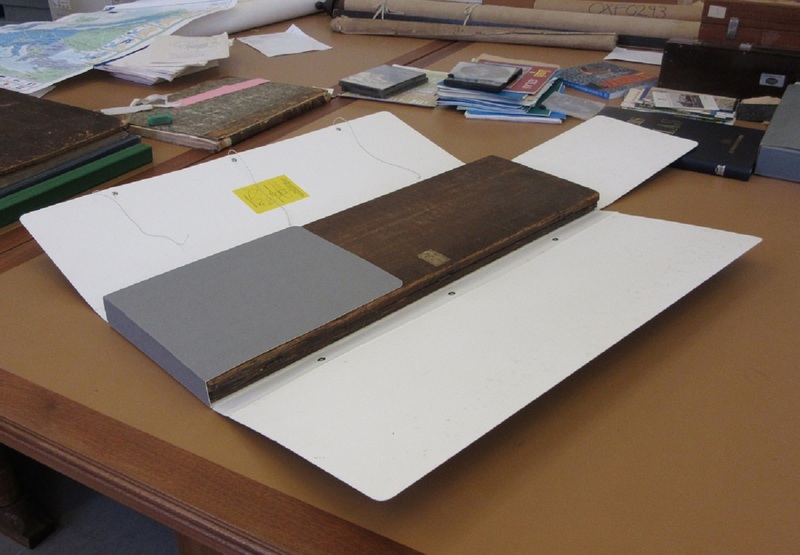 The map has holes in the corners, suggesting that at some point it was pinned to a wall, and there is a strip of paper on the reverse running along the middle, an indication that it has also been stuck into a book. This doesn’t detract from the attractiveness of the map though. Similar in design and purpose to Estate maps the cartographer William Morley has richly decorated both the houses and the borders with the compass rose and flowers, as well as the columns and edge decorations. 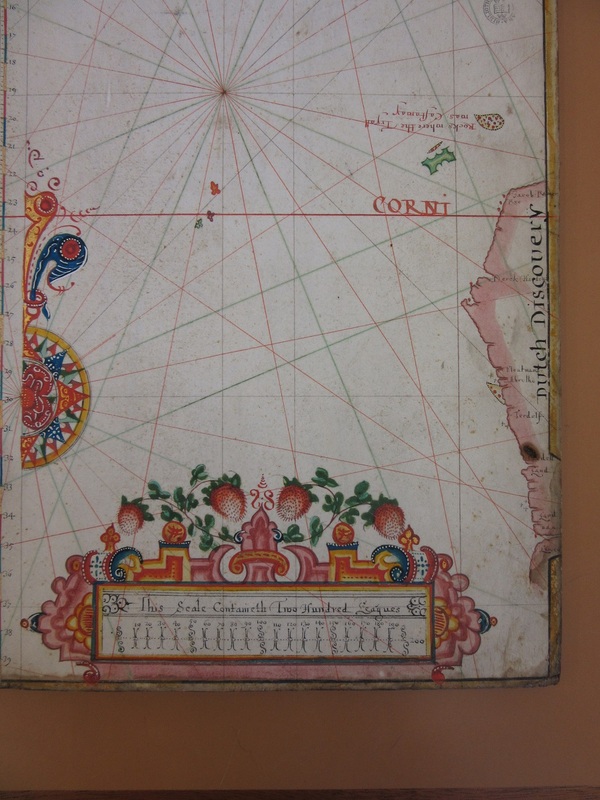 The map comes from the Gough collection, one of the most important of all the donated collections to the Bodleian. Richard Gough was a noted antiquarian who collected topographical prints, drawings and related items. Included in his collection, which came to the Bodleian after his death in 1809 are the Gough Map (http://www.goughmap.org/map/) and the Sheldon Tapestries. 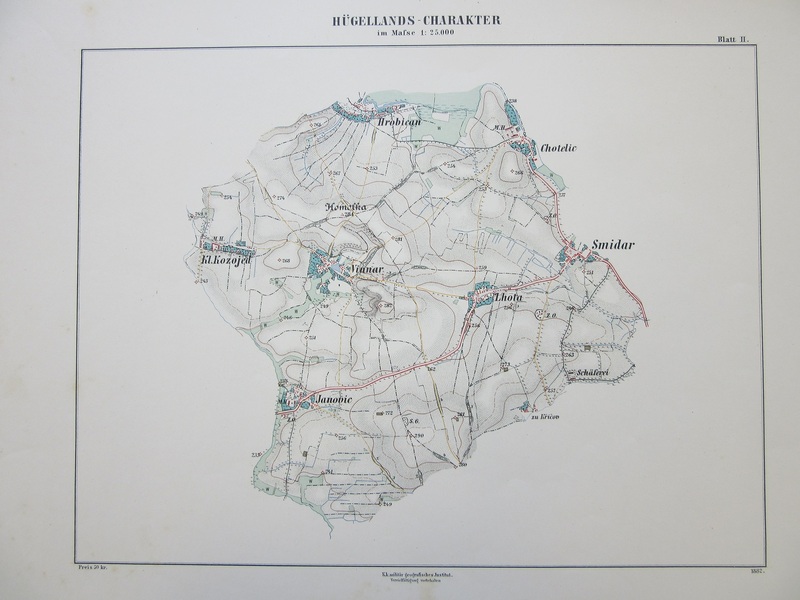 Almost all the maps from the Gough collection are black and white, making this beautiful plan of Haslemere stand out. This entry was posted in Cartography on 25 October 2017 by stuart. 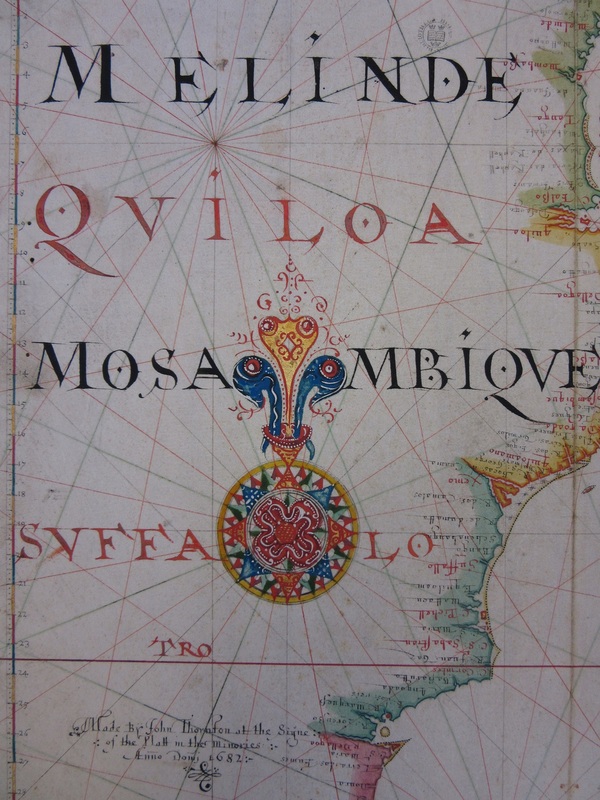 In twenty-five years of lectures and field trips The Oxford Seminars in CArtography (or TOSCA to its friends) has called attention to the enlightening power of maps. The series has shown how maps were co-opted into Enlightenment projects as tools for rational enquiry and the implementation of ‘improvements’. We have seen maps as part of Enlightenment science – used by individuals, institutions, and governments to understand, demarcate, control, codify information about, and change the lands under their jurisdiction. The power of maps to open up lands, seas, peoples, and the rest of the natural world to the questing gaze of the outsider has been a constant TOSCA theme. 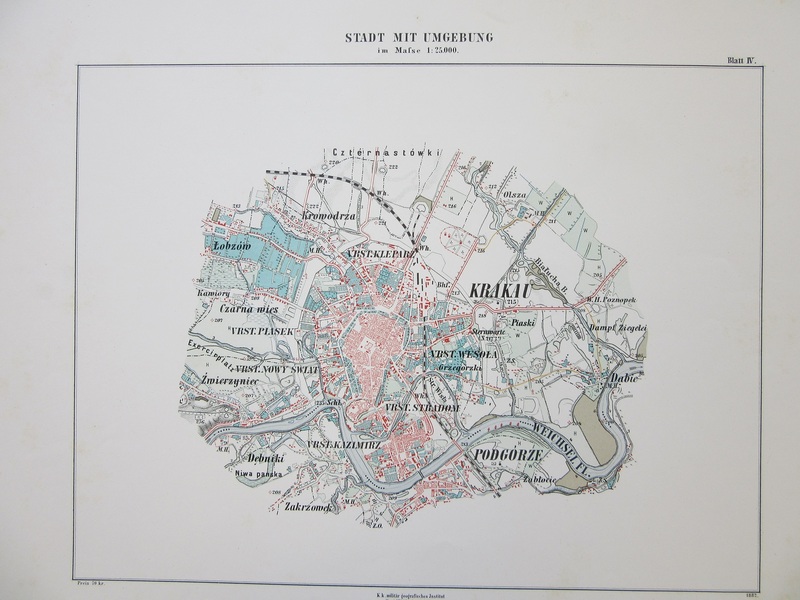 TOSCA seminars have also interrogated maps dating from before and after the Enlightenment but which shed light on phenomena and connections between them. TOSCA audiences have seen how – on the wall of the schoolroom, in the wartime operations room, in the hands of the traveller, in the mark-up room of the newspaper editor, in the cabinet of the scholar, or on the laptop of the engineer – maps shape our understanding of the world, ourselves, and our place in the world. Though TOSCA seminars have amply demonstrated that maps can be tools of the elite and powerful, they have also uncovered mapping undertaken by the ostensibly powerless, as revealing exercise in citizen science, and as a means for those with radical, subversive, or countercultural agendas to enlighten audiences about the nature of elites. To celebrate 25 years of TOSCA’s cartographic explorations an all-day symposium and map display was held in TOSCA’s home, the Bodleian Library, for which papers were invited on the theme of Enlightening Maps. Topics were to reflect but were not be limited to the themes outlined above, that is, maps of the period known as the Enlightenment but also maps used to shed perhaps unwelcome light on contentious questions of every sort and from every period. 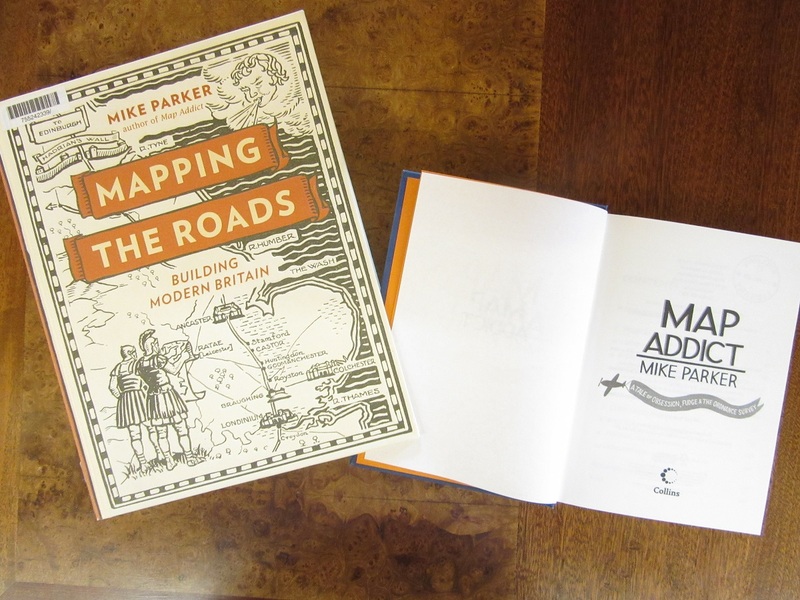 Friday 22 September saw the staging of “Enlightening maps: celebrating 25 years of The Oxford Seminars in Cartography” at the Weston Library. TOSCA has now been running since 1993, showcasing maps and mapmaking with one seminar per term, plus an annual field trip. The events are open to all. We wanted the day to showcase a number of issues and formats. Whilst the over-arching title of “Enlightening maps” came quickly, we needed to populate the day with a programme that would entice people to help us celebrate the occasion. Two keynote speakers were deemed to be essential, and we invited Danny Dorling, Oxford’s Halford Mackinder Professor of Geography, and Mary Pedley, University of Michigan to top and tail the day. 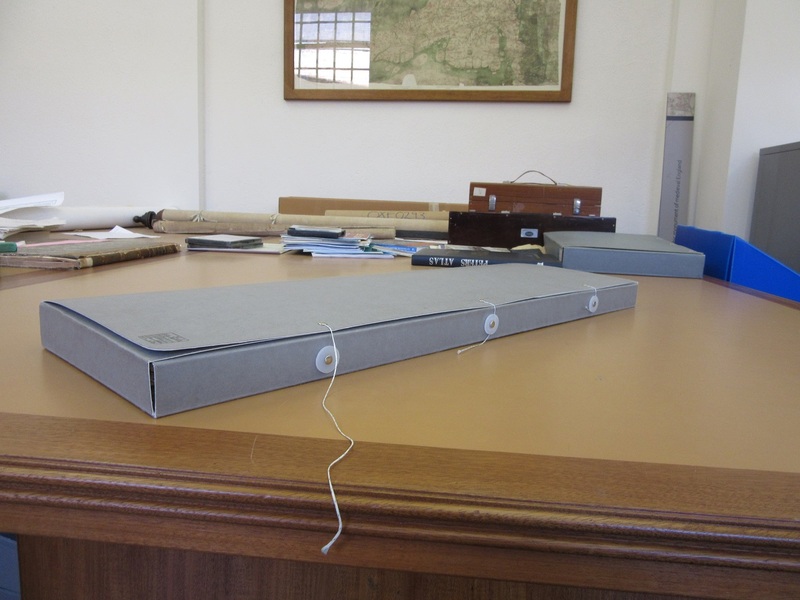 Space was made available for four 20-minute papers, as well as a slot for “Cartographic conversations” which was designed to allow presenters to discuss their research in front of items from the Bodleian’s map collection. Two of our four “20-minuters” took up this opportunity, along with four further presenters. Thus the day was set. We also booked the Divinity School for a drinks reception, as well as a room above the St Aldates Tavern for an evening meal. We even persuaded author and broadcaster Mike Parker of ‘Map addict’ and ‘Mapping the roads’ fame to deliver a toast in the Divinity School. In total 58 people registered for the day (including eleven speakers and five Map Room team members on hand to help with registration and general logistics). Our visitors were both local, 33 coming from Oxfordshire; and international, with one from Germany and three from the United States. Registration and coffee seamlessly merged into a general welcome, and then Danny Dorling’s opening presentation entitled ‘New ways of seeing the World: a social geographer’s perspective’, awash with cartograms and challenges to map social data on a global level set the day’s mapping activity into motion. We then hit upon our first pair of talks under the banner of Enlightening maps: modernity and postmodernity, which featured Megan Barford (Royal Museums Greenwich) on ‘Cartography and forced migration: a contemporary collecting project at Royal Museums Greenwich’ which looked at current manuscript maps created for migration routes for Syrian refugees attempting to reach Britain. Then came Kenneth Field (Esri Inc. / International Cartographic Association) on a very topical ‘Fake maps: the new age of cartographic enlightenment’, which included Ken’s take on Fred Rose’s serio-comic maps of the late nineteenth century, as he showcased his own “serio-comic” Trump’s ties World map. After lunch we were back with a double-header on The European Enlightenment and its maps, Katherine Parker (University of Pittsburgh) opening with ‘Charting chimeras: the creation and rejection of Pacific geographic knowledge in the eighteenth century’ which included the story of Pepys Island off the Argentine coast – frequently mapped, yet never ever in existence. She was followed by broadcaster Vanessa Collingridge, who spoke on ‘Mapping myths: the fantastic geography of the Great Southern Continent, 1760–1777’. Our next plan was to try to replicate the atmosphere of our field trips, and so the delegates were transported upstairs where they could move freely between the Bahari Room and the Centre for Digital Scholarship for a series of Cartographic conversations. 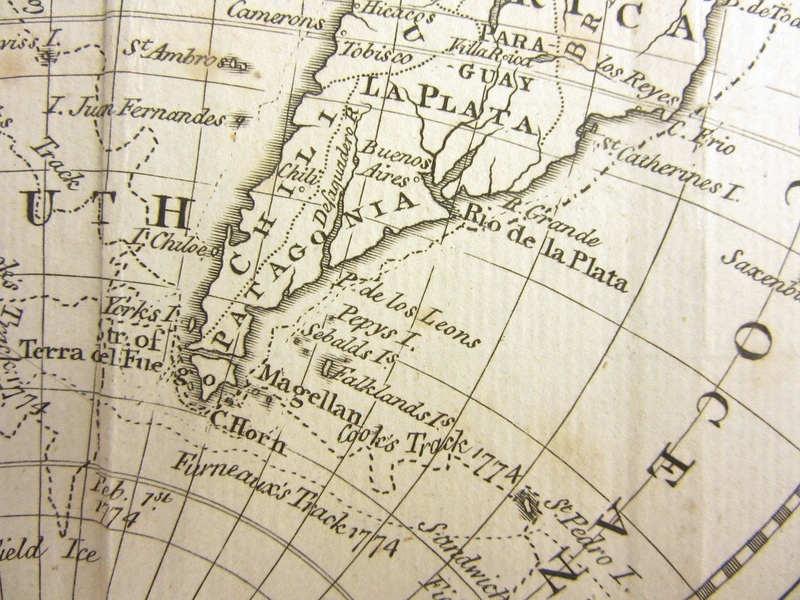 The Bahari hosted Katherine Parker showcasing material to support her paper, alongside independent scholar Paul Hughes, who was demonstrating ‘The evolution of the Prime Meridian: the cartographic evidence’, and another independent scholar, Jane Reeve, with ‘War and paradise: the maps of James Bruce, the ‘Abyssinian traveller’’. The CDS hosted Ken Field who added the likes of the Ghanaian “elephant map” where an elephant-shaped contour lines can be spotted, as well as a current Ordnance Survey Landranger map with “BILL” drawn into some sea cliffs. 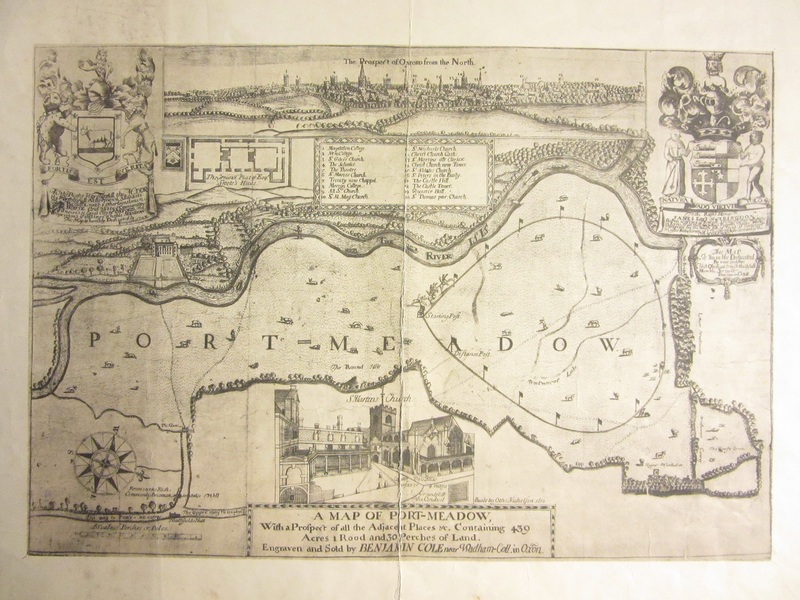 We also had freelance cartographer Giles Darkes on ‘Historic Towns Trust maps’, and Oxford independent scholar Mark Davies looking at ‘Unlocking the secrets of Benjamin Cole’s maps of Port Meadow, Oxford c.1695 and c.1721’. Following a tea break, we returned to the lecture theatre for the second keynote – Mary Pedley on ‘Mapping in the European Enlightenment’, a wonderful tour de force to end the day’s formal proceedings. The day’s highlight had to be the Weston Library itself. The event was a perfect fit, using the lecture theatre, and also the Bahari Room and the Centre for Digital Scholarship. Such an event could not have happened without the Weston Library, and the response from visitors was unanimously positive. So what happens next? The 2017/18 TOSCA programme has been announced with seminars on the Selden Map, nineteenth-century British cartography, and the future remit of Ordnance Survey; we also have a field trip based on GIS and the First World War. Additionally, we feel that a day such as this warrants repetition, and so we have booked the same combination of rooms for Friday 25 September 2020, and a 28th anniversary celebration. This entry was posted in Cartography on 5 October 2017 by stuart. The things you find behind the most unimpressive of covers. 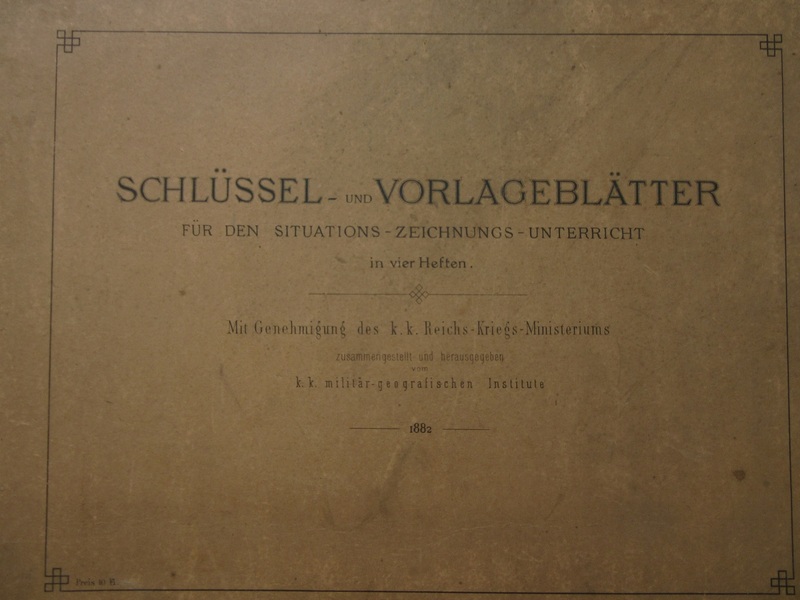 The Schlüssel und vorlageblatter für den situations zeichnungs unterricht (which translates roughly as ‘Key and template for drawing lessons’) is a teaching aid created by the Institute of Military Geography in the Austro-Hungarian Ministry of War in 1882 for the drawing of maps. Inside there are a number of different terrain examples and sheets showing scales, text, topographical features and legends. The book also has technical aids for depicting hachures, and has a number of pages dedicated to the problem of representing height on a flat sheet. 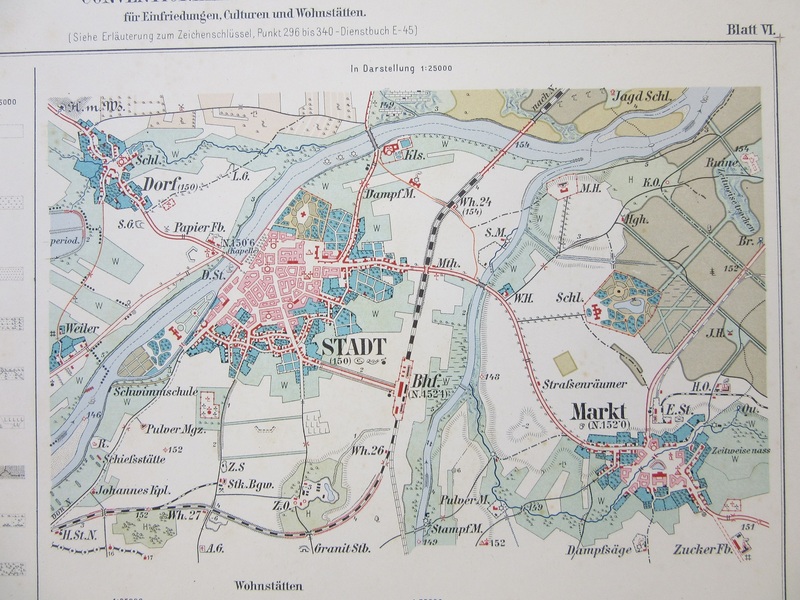 The idea is that military cartographers working for the Institute would use these maps and legends as a template to create maps without variation in design, creating uniform mapping easily understood by troops in the field. This entry was posted in Cartography on 15 September 2017 by stuart.